Hotel Caravaggio i Rom, Italien: Reservér nu! 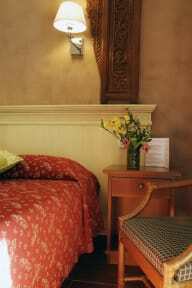 The Hotel Caravaggio is a 3 star Hotel ideally situated in the heart of Rome. The Hotel is the ideal base for visitors wishing to explore on foot the wonders of the Eternal City and to wake up in a quiet and pleasant atmosphere. All the rooms are equipped withfree wi-fi, private bathroom, towels, hairdryer, courtesy kit, telephone, TV, minibar and air conditioning/heating. There is also a central safe box at the reception. The price includes breakfast, welcome drink and city map. At the Hotel Caravaggio we serve classic Italian breakfast. 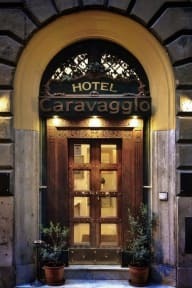 The reception of the Hotel Caravaggio is opened 24 hours a day. The payment is requested on arrival in cash. The courteous and friendly staff can give you information you need, city maps, information for the booking of sightseeing tours and airport transfer. Everything that is a part of the Rome experience: monuments, museums, galleries, theaters, shops, restaurants, bars and night life is within walking distance. The Hotel Caravaggio is situated only few steps away from all the historical Rome: Piazza di Spagna and the famous Spanish Steps, Trevi Fountain, Colosseum and the Roman Forum, Trastevere, Piazza Navona and the Pantheon, Via Veneto and the renown 'Dolce Vita', Via del Corso and Via Condotti, the focal point of the finest Italian fashion. The St. Peter's Square and the Vatican are 10 minutes away by underground. Nearby the Hotel Caravaggio you will find all the public facilities as the underground and the bus. The area is also very well connected with both airports.